Don't you hate having to ask for the rent? A Late Notice is one thing, but an Urgent Late Notice is pretty serious. It is an attractive, intimidating and official looking form modeled after a 72 Hour Notice of Eviction posted by our Sheriffs Dept. 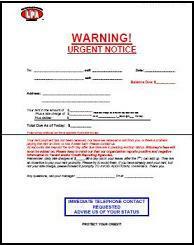 This form is often used instead of a Notice to Pay Rent or Quit. We have found the Urgent Late Notice to be one of our most effective forms in getting the tenants to pay the rent and the late charge. Puts the residents in default on notice that their account is now classified as being in "EVICTION STATUS"
Formally makes a Demand for Payment. Many courts will delay your eviction without an actual "Demand for Payment".